Rest day on the schedule today. IT Band is still sore from yesterday's race. Lots of hills. Overall, a really great race with roads, trails, and dirt roads. I have decided to use a new format in regards to the race reviews. As many of you know, there are several categories that the race should be gearing their attention to in order to bring runners back again. Obviously there are many, many more categories that the race director must attend to so I'll just review the most common areas that runners notice. Registration was straight forward and was completed on Active(dot)com. 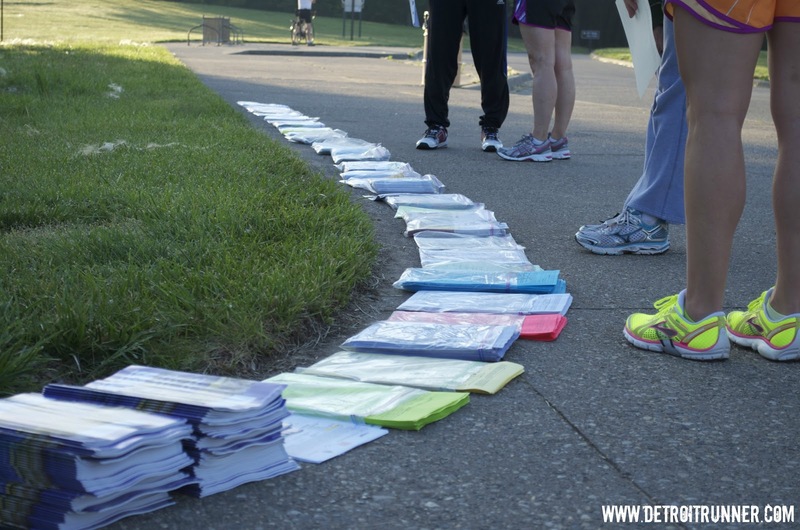 The race allowed for two times to pick up your race packet prior to the race. 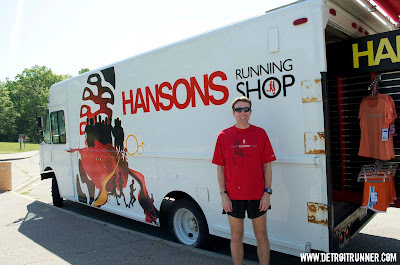 You could go to Hansons Running Shop in Utica and pick up your packet a week before the race and also the day before the race. 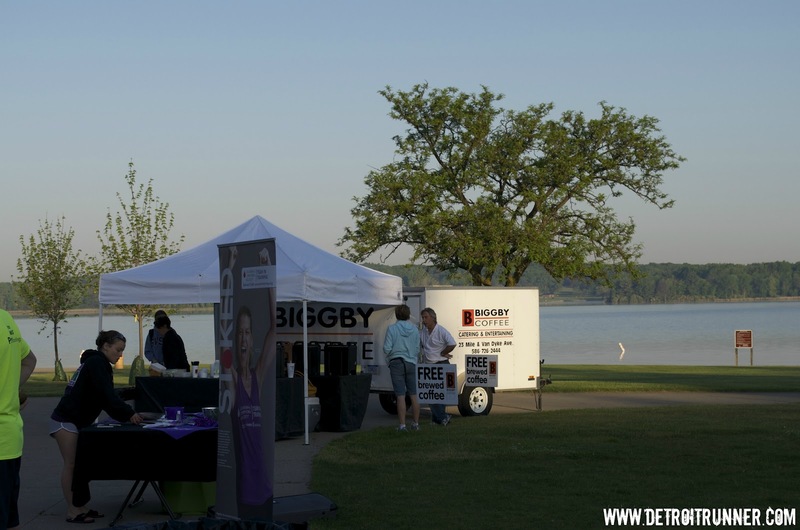 In addition, you could pick up your packet the day of the race before it started. I'm sure having these extra times prior to race day helped keep things more organized the day of the race. I opted to pick up my race packet a week before the race. 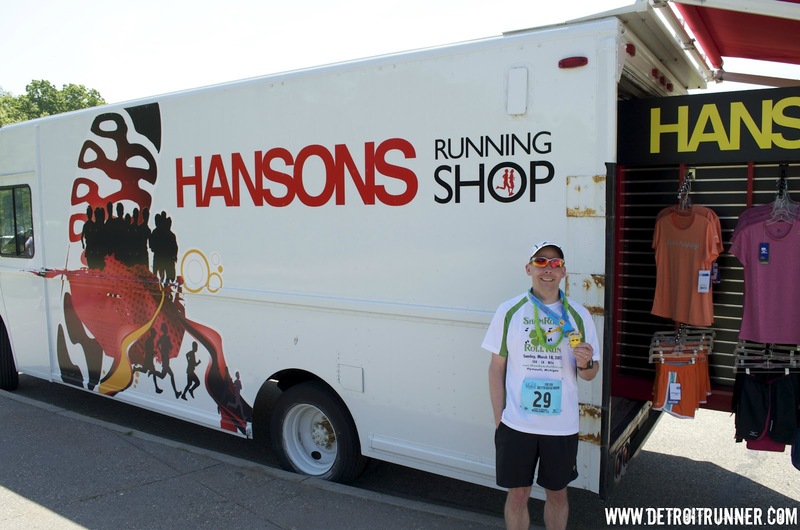 I got to Hansons at the start of packet pick up and it was packed with runners in line. In conjunction with packet pickup, Minzuno was there giving away prizes and also offering discounts on their merchandise. I thought that was a great thing to have at packet pickup. 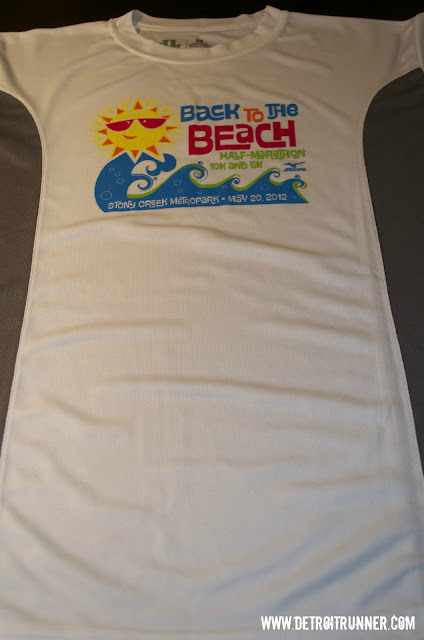 The initial packet pickup was a little disorganized as you had to wait in line to get your number, then you waited in a second line to get your glass and timing chip. While waiting in line, you needed to have your race number to give to the volunteers but that was not made known until we were in line. Not a big issue if you had someone else there with you, otherwise you had to get out of line to get the number. Fortunately, someone saved my space so I did not have to wait in line again. I would say about 15 minutes after waiting in line(there were lots of people), the organizers moved the race bib number list to where you could see it without getting out of line which in the end worked much better. I'm sure many runners did not understand why we had to wait in a second line to get our race chip(I didn't) but that was needed because Hanson's Race Management uses old technology still - basically an old "Champion Chip" type technology. 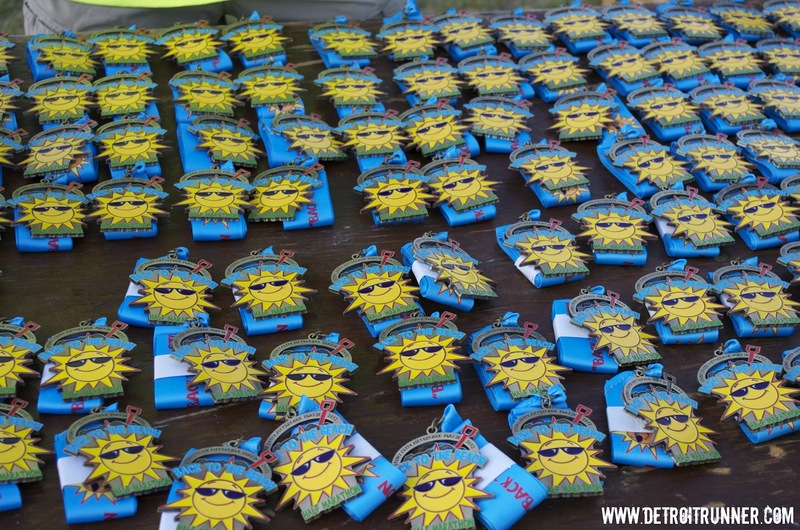 Because of this, you had to be assigned a chip with your number on it and make sure to get it back to them after the race so you would not be charged. It worked fine for the race so I have no complaints there but given the race management company is run by a world class running company, you would expect that they would have the latest B-tag technology. Well, at least I expect it. 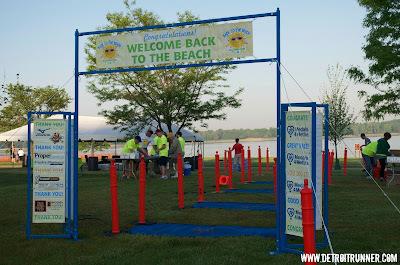 The start area and the race location were excellent. 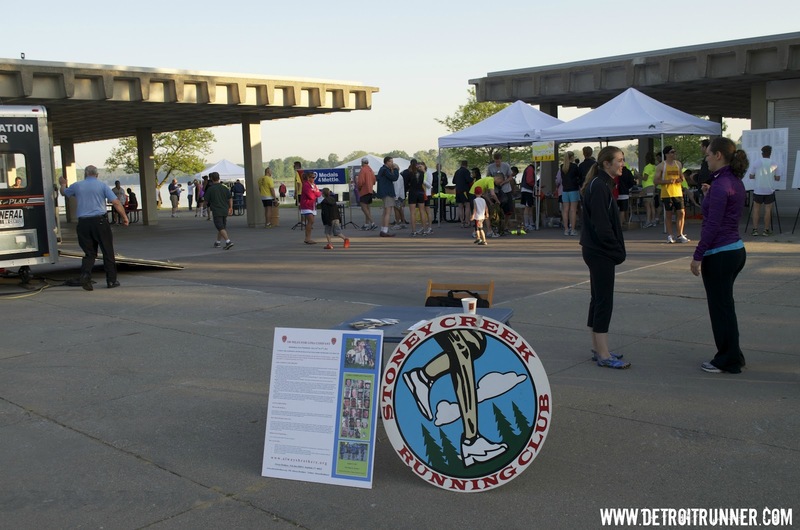 This race was located at Stony Creek Metropark at Eastwood Beach. I train at Stony Creek all year so it was nice going to a race so close to my home. It's set up to hold lots of people and it also has lots of parking. Even if you did not get there very early(I was there about an hour early), there was plenty of parking very close by. 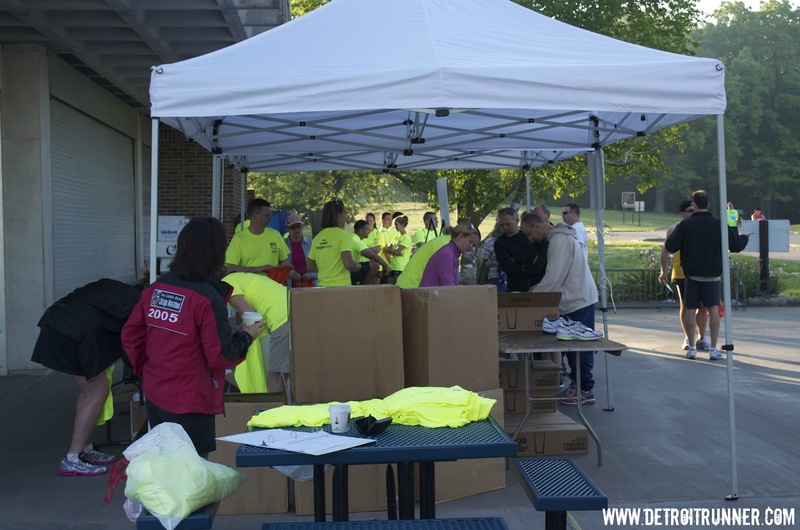 The start area was also very organized as well. 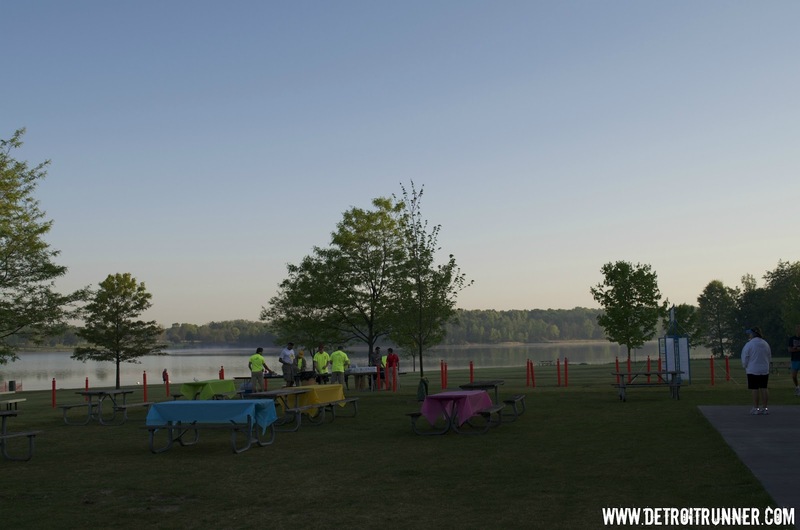 There was plenty of room to hang out, packet pick up was right when you walked into the area and the start line was easy to find. Matt from Faster than a Turtle was nice enough to come out and say hello. He was running Stony Creek for his last long run before his first marathon next weekend - Bayshore in Traverse City! 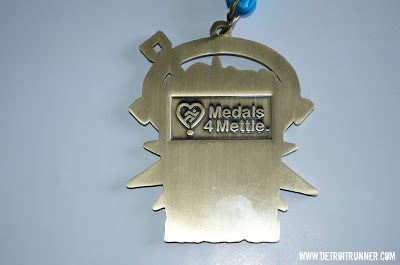 This was also my first marathon and a great race. Good luck Matt! 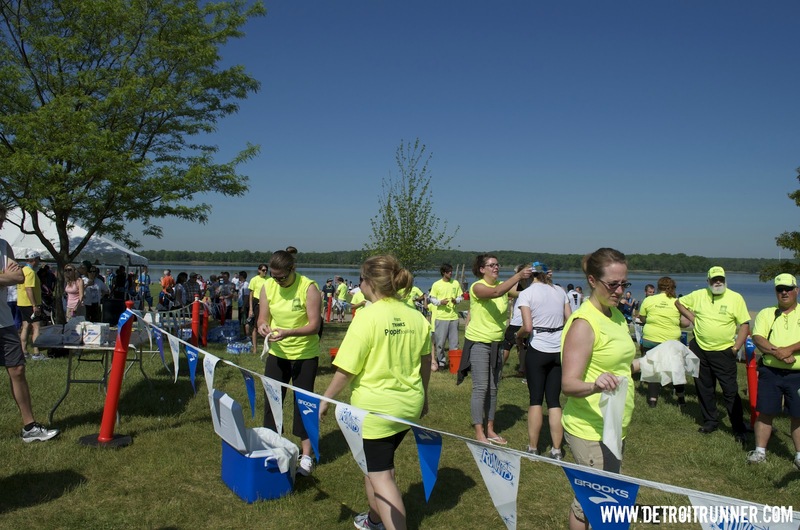 Start right by the lake; great day but hot! Coach Ken!!!! (Does that guy ever say no?) Ha! Anyone want to earn a medal? They even had Biggby Coffee giving out free coffee prior to the race - a nice touch. There were seven port-o-potties for the runners which was more than enough. 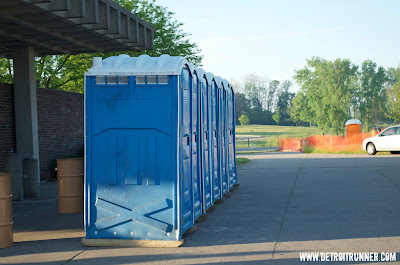 We could also use the regular bathrooms from the park which was nice. 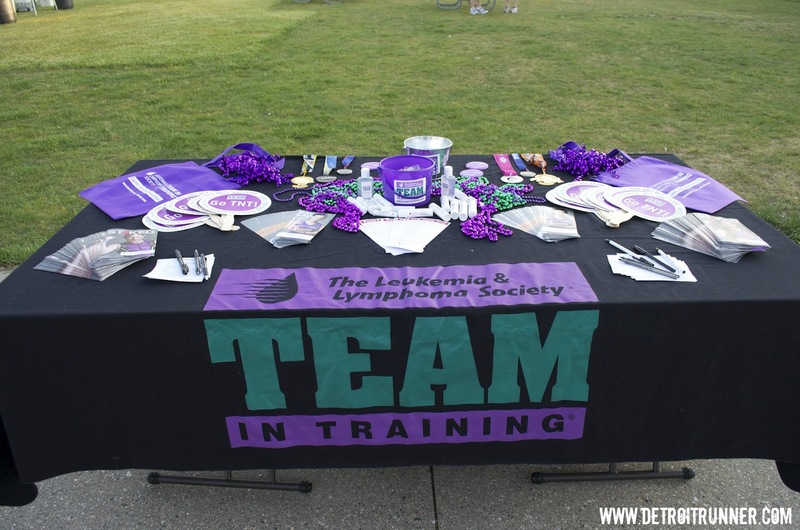 When I got there, volunteers were getting everything set up so that everything went off without a hitch. The race let people out in waves. 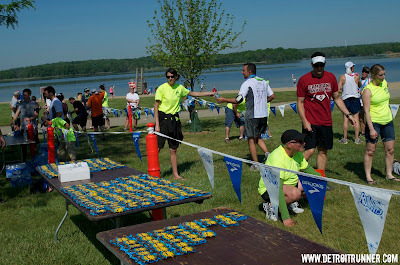 I think that was a great idea; however, is seemed that many of the runners did not line up where they should be. 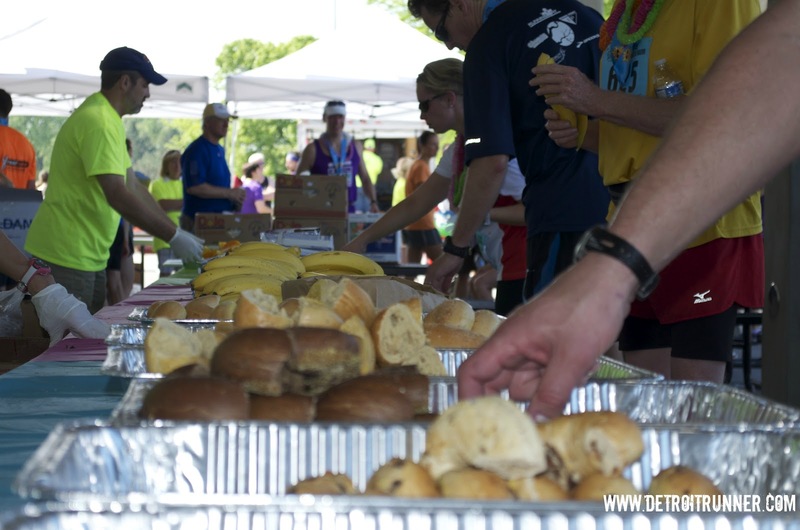 Slower runners to the back of the line please. What the wave start did do was help keep things from getting congested. It would have been crazy to let everyone go at one time - the wave made for a much more enjoyable experience at the start. It was hot for the race but it helped that part of it was shaded on the trails. The course was laid out quite well. It started on grass, then moved to trails, then asphalt paths, then more trails, then dirt roads, then more trails, then the asphalt path again and finally some more grass and trails to finish off the race. Perhaps it was just me but my Garmin registered in at 13.02 miles. Very disappointing to say the least. The course was not a "certified" course although I'm not saying that's why it may have been short. 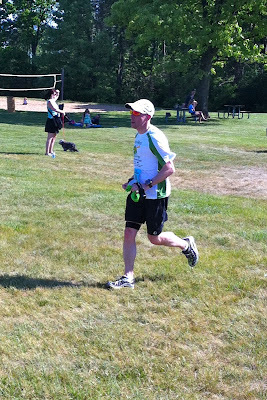 In seven half marathons and over 27 races, I have never run short on a race - this was the first. I have almost always ran long. The course layout? Excellent. It was very challenging in parts and always seemed like you were running on a hill. While challenging, it was not unreasonably so(ok, maybe mile 8 ha!) 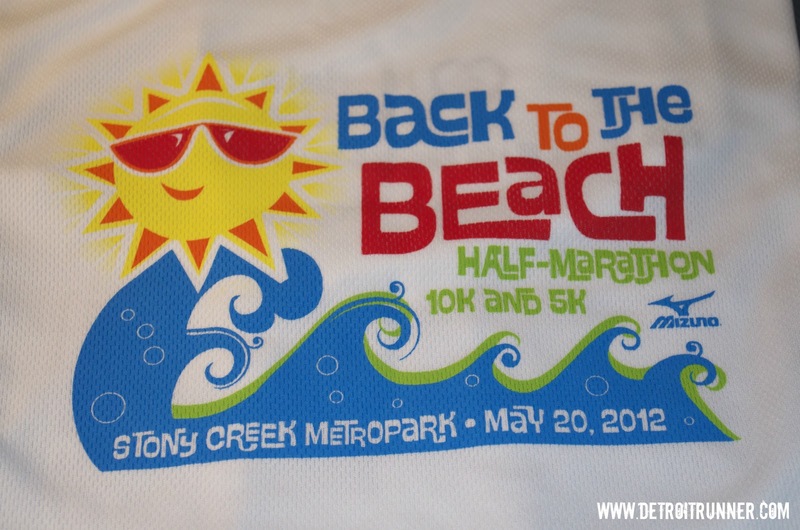 and most people that run half marathons would really enjoy the course. It might be a little tough for a first half marathon. Very scenic in my opinion and I enjoyed running the trails. I would have been even happier if the course was all trails. Just before mile 8 is a really tough hill to test your stamina. 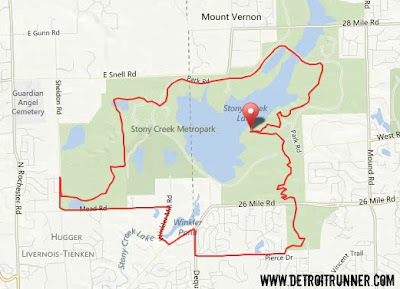 I would say that if you have not run Stony much and want to see more than just the 6 mile path around the lake, run this and it gives you a great sense of the trails offered at the park. There was also plenty of police support to help keep everyone safe. 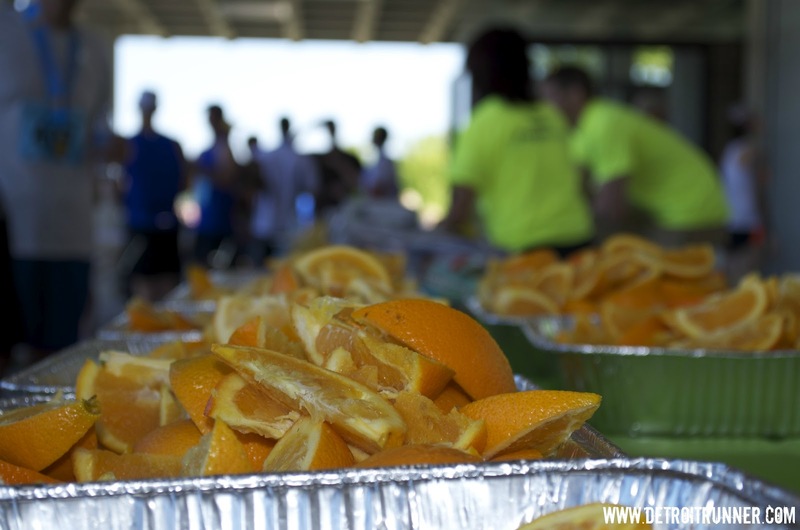 There were plenty of volunteers on the course to keep you on the right track and cheer you on. There was not one point where you wondered where you should go. In addition, there were painted arrows on the path all over the place showing you the way along with signs. Here a picture Matt got of me at the finish! Wow is all I can say!!!! The aid stations were incredible and staffed with incredible volunteers. It felt like running a full marathon. All of the stations had water and most of them had gatorade. They even had three stations with cold towels. 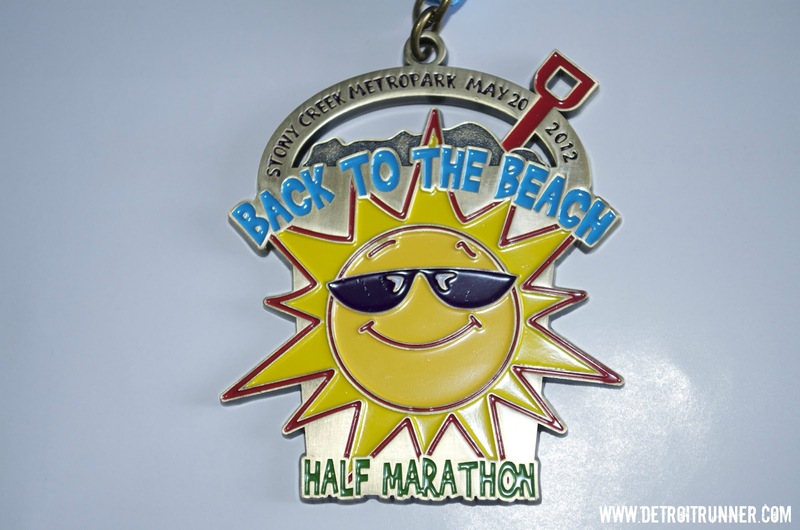 I have never seen that with a half marathon and it was a really nice added feature. 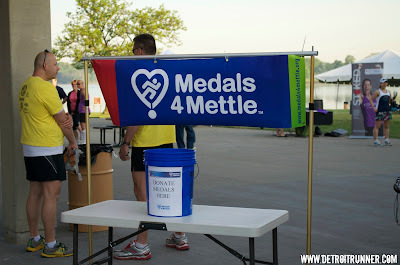 This was especially appreciative given the warm weather we experienced during the race. They also had two GU stations - more than enough! 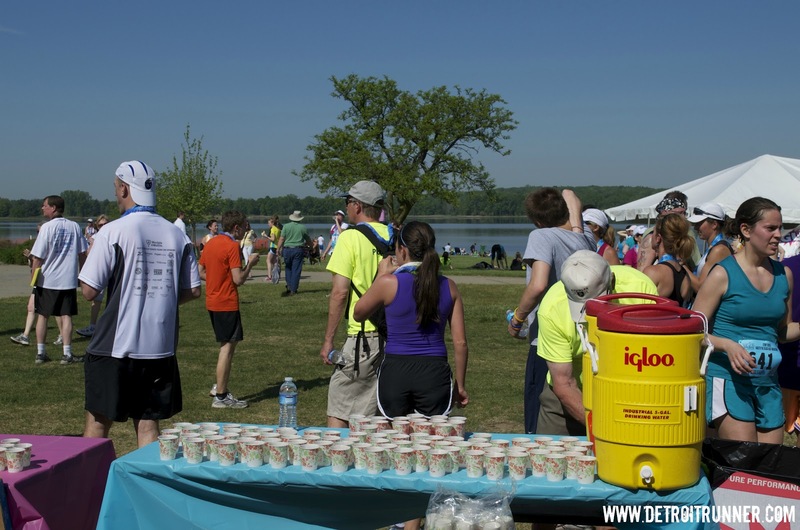 Probably the best aid stations for all the half marathons I've run. 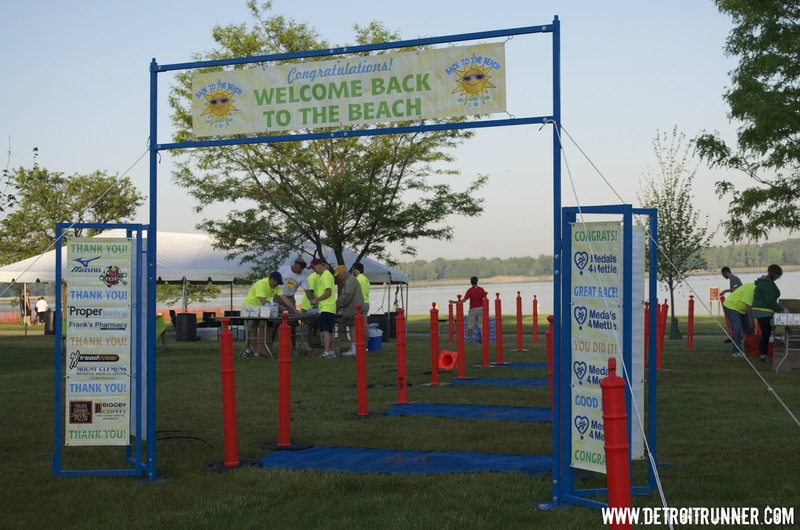 The finish area was right at the same spot as the starting area so it was all ready for us to finish. 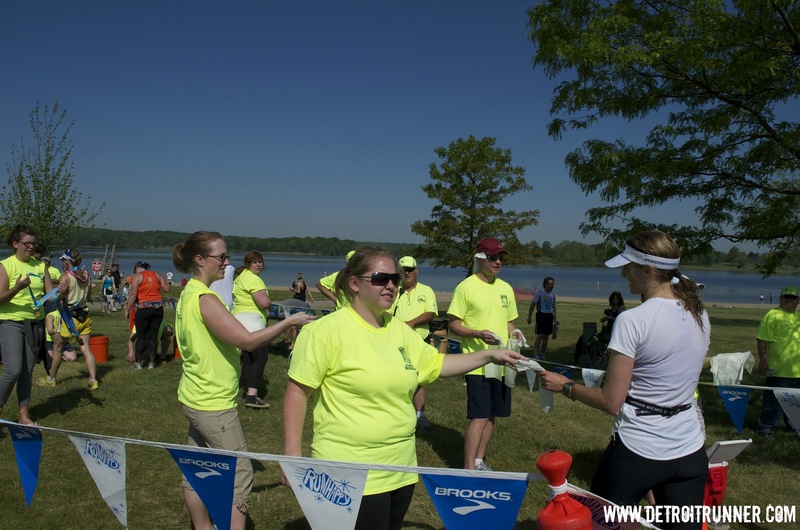 As you crossed the finish line, there were volunteers there to again give you a cold refreshing towel. Right behind those volunteers were the volunteers giving out the medals and they were really good about it. They came right up to you and put it on you and said congratulations. 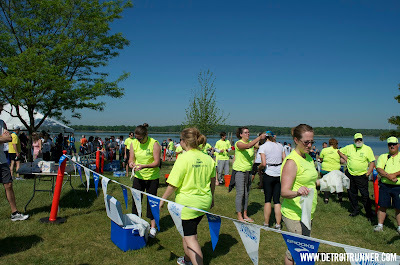 From there, you continued until you met volunteers who were cutting off the tags for the timing chip. Because this is not a huge race, having people there to cut off the chip was fine but I could see this being an issue if the race grew larger. Behind the guys cutting off the timing tags was people handing out water. 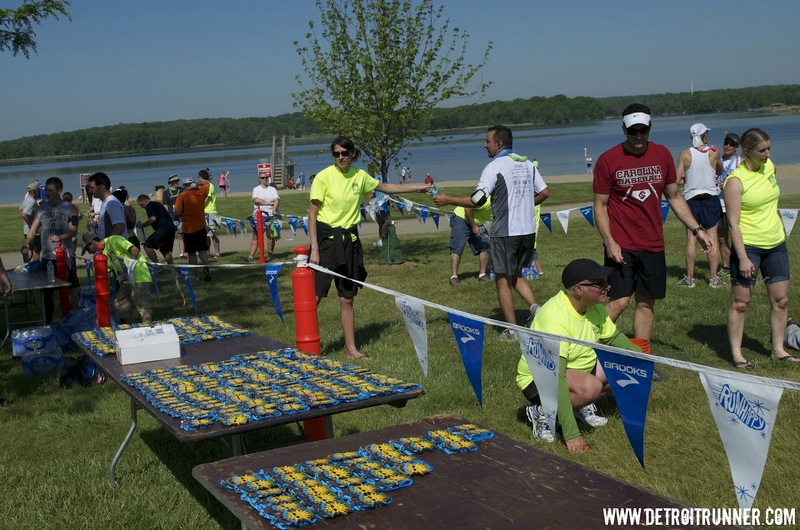 It was all very organized at the finish. Once you got out of the race finish, you could head over to the line where there were plenty of things to eat!!! They had bagels, bananas, orange slices, pretzels, Cliff bars, Kellogg energy bars. More than enough foot for everyone and I was there until most of the runners finished. They also has a complimentary massage if you wanted it. The race also gave you a nicely designed shirt, a race medal and a Back to the Beach glass. 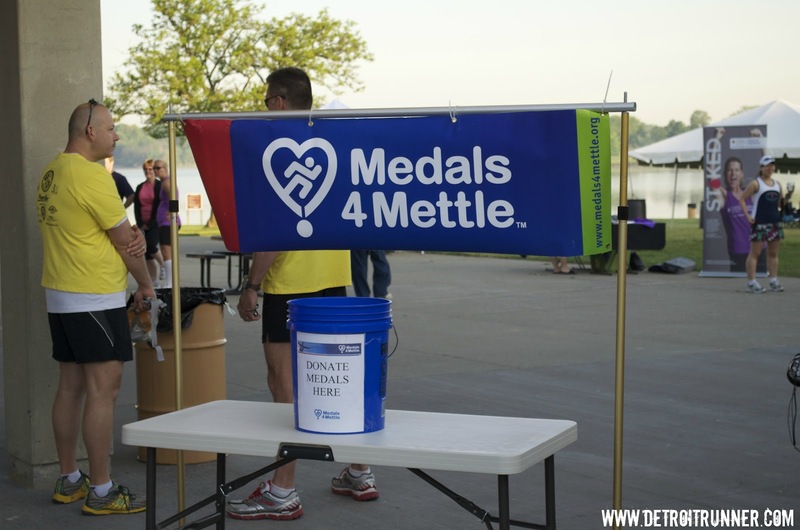 For the cost of the half marathon, you really got your money's worth. Coach Ken again! I don't think he even saw me take this. Ha! Organization is one of my big pet peeves. 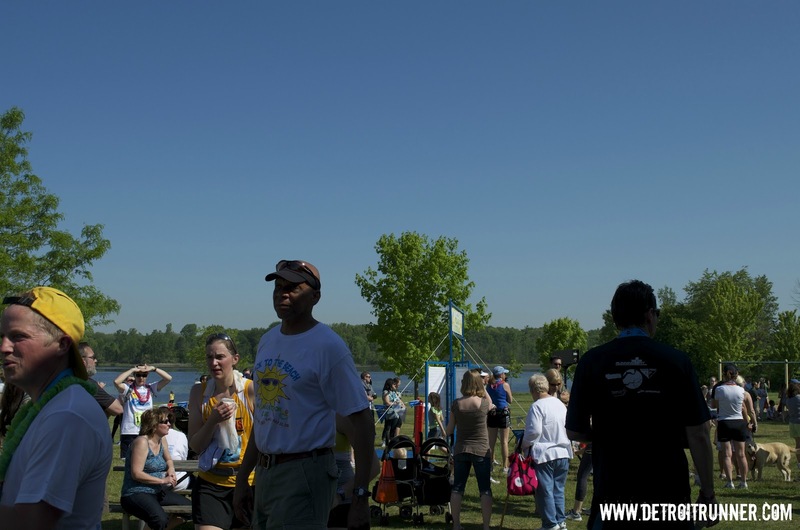 Fortunately, this race was well organized overall. 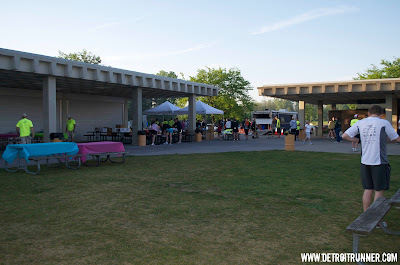 With the exception of the packet pick up being a little slow when I went to get my packet, the overall day was well planned out in each area. Overall I felt the race was a great race and lots of fun. 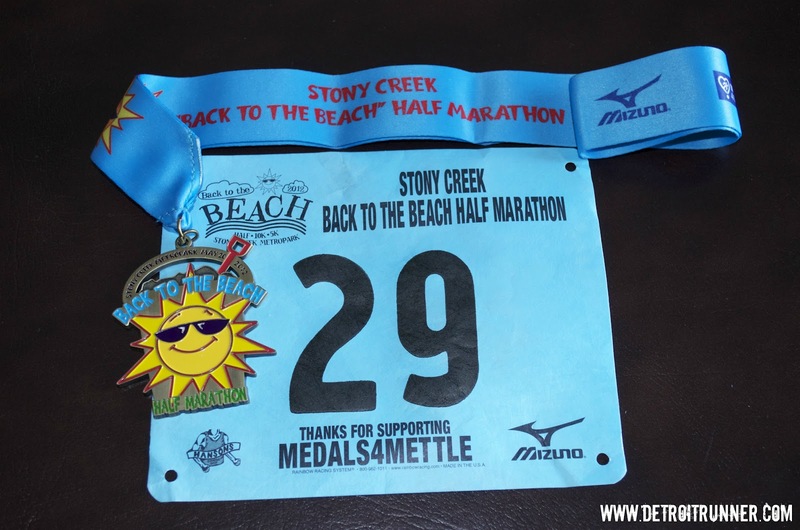 It's at a great time of the year and a great way to see Stony Creek Metropark. 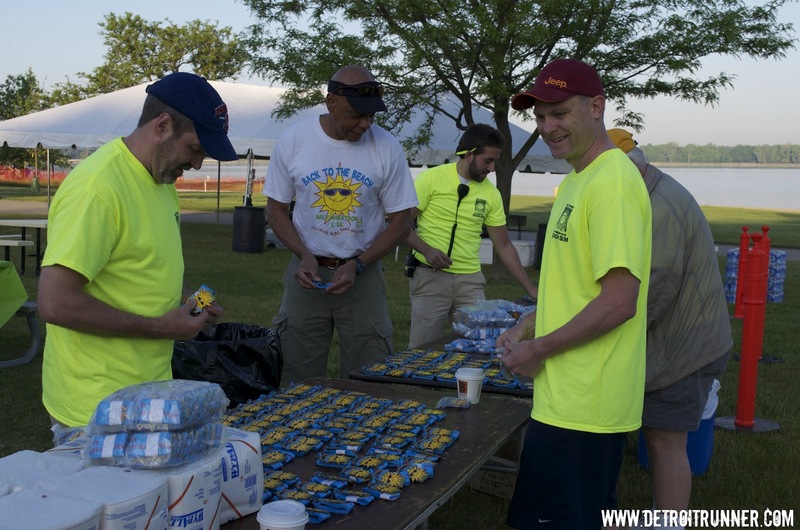 You can tell that the race is organized by runners. The volunteers were amazing, the aid stations were the best I've seen for a half marathon and the course was a really great challenge. I'm still hurting. This would be a race that I would do again in the future. Jeff, I guess I should learn that word! It was a great time and I'm glad you enjoyed the race. This is a different approach to reviewing a rce and I like it. Wish I had known of this. Maybe next year. Damn man! You are speedy! You've come so far in your journey since I started reading your blog. You rock. Looks like a really good race! Great job, especially considering how warm it was. 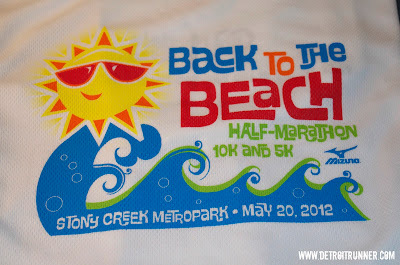 Might try this race next year. Yes, the race sold out early this year. Looks like a great race!! I would love to run it someday! My husband's and my first half marathon was hillier than that but I agree your first half marathon shouldn't be THAT hilly! (We learned the hard way). 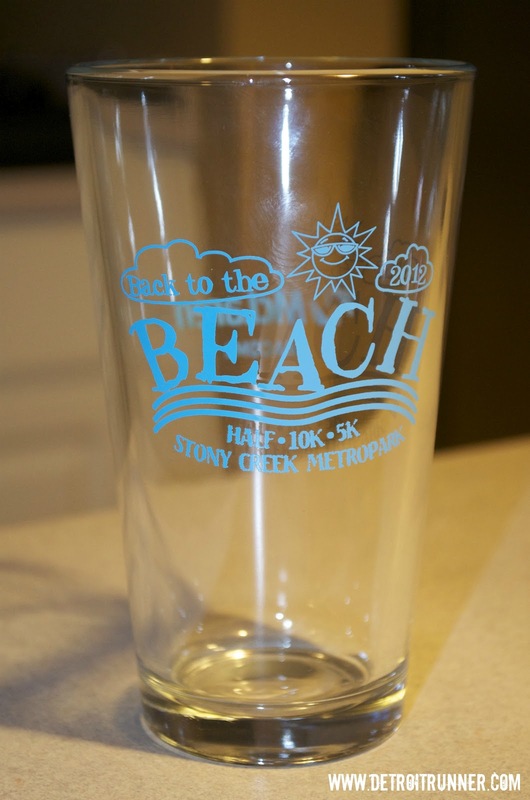 Love the medal and the glass! Sounds like a great race. Loved your review points. Sounds like a really nice race! Nice review! 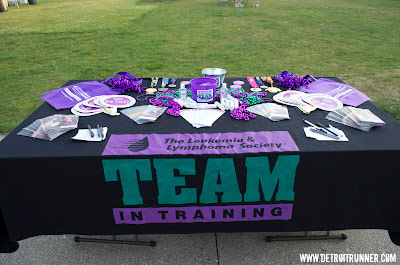 Ran the 5K last year and had a great time! I definitely want to try the half if I can get back out there in May. Great job!! 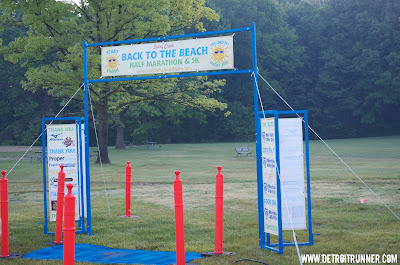 You review races in quite a different way to me... but ether way the readers know what to expect if they find themseves on the start line the next year. Haha! Yes, every other weekend. No so sure - I already have the sub 4 but it's not as low as I'd like(3:58:45) The trail races do give me appreciation for what you run daily. You would tear up a flat road race Coach. Wow, I had not run in Stoney Creek before, and was completely surprised by the hills and how they just never seemed to end. It was tough, because I was hoping to PR, and came no where close. I felt I was either running up a hill, scrambling down a hill, or running on a bike path with no shade in place. I do agree completely about the support on the course...it was excellent! Congrats on another great race! I always enjoy reading about races I've never heard of, learning more of what's out there. This was my first half and I found it difficult but beautiful. It was so well run and I loved the support from volunteers and neighbours in the area. This review will help anyone wondering what this course is like. Your pictures are great. Good review. I ran this race last year, too. Like you my Garmin registered the course as short - 13.01 last year, 13.02 this year. 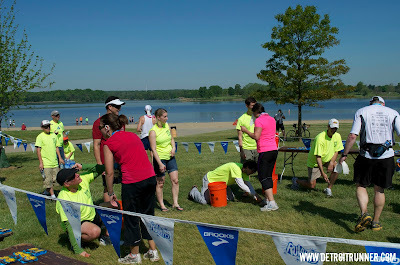 Loved all the volunteers and the aid stations were great. Looking forward to next year.